The leading experts on parent-child communication show parents and teachers how to motivate kids to learn and succeed in school. 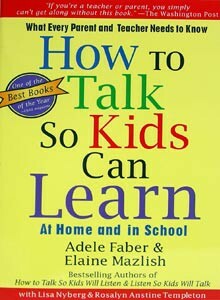 Using the unique communication strategies, down-to-earth dialogues, and delightful cartoons that are the hallmark of the book, Adele Faber and Elaine Mazlish show parents and teachers how to help children handle the everyday problems that interfere with learning. Softcover. 267 pages.